As you’re probably aware, our Foundation operates a Social Security Advisory Service featuring a staff of five Certified Advisors available to respond to inquiries about how the rules apply to individual situations. 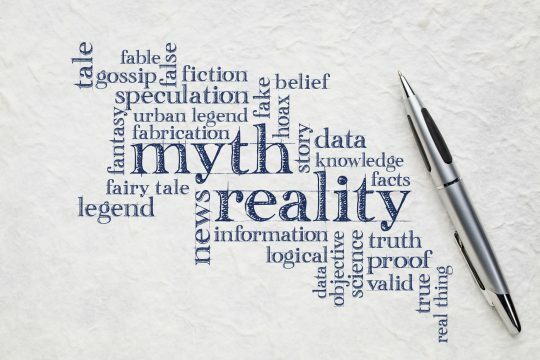 We also receive many general inquiries about the state of America’s Social Security program, with some of these questioning anecdotes or old stories “heard on the street.” As professionals, we try our best to set the record straight by presenting the facts that dispel the rumors that just will not seem to go away. One of the most persistent rumors we deal with is the thought that America’s political process has resulted in persistent “raiding” of Social Security’s reserves for purposes having nothing to do with the support of seniors who have earned the benefits to be paid out of the System. We frequently post information addressing this issue, often through our Social Security Report website, or via special coverage in our “Ask Rusty” Q&A series. One such article appearing in AMAC’s Advantage member magazine’s January/February issue drew a response from a member raising the “pilfering” issue and questioning the structure of the program’s trust fund accounting. Here’s a reprint of the letter we received, followed by our staff’s response and clarification of the matter. It’s thought provoking, and we know it won’t go away, but it’s interesting to hear readers’ viewpoints and to have the opportunity to respond. 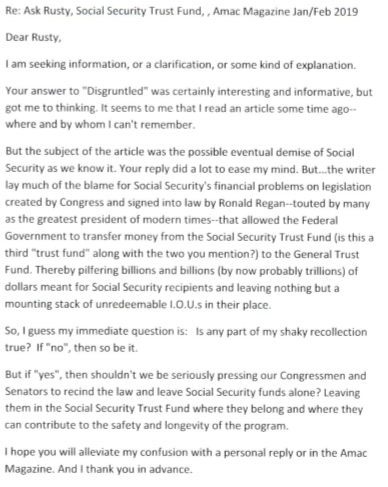 Thanks very much for your feedback on my article in the AMAC Magazine about the Social Security Trust Funds. Your memory serves you well, as there have been many articles written about the perils facing Social Security and the supposed nefarious deeds of the Federal government with money collected for same. I can’t speak directly to the article you refer to, but I’ll try to clarify what has historically happened and how the system truly works, and I hope that will serve to alleviate your confusion. The original Social Security Act of 1935 was amended over the years to add various types of benefits for spouses, survivors, minor child dependents, disabled workers, etc. Changes to the payroll tax (FICA) rate (which started at 1%) to fund the added benefits were also made over the years bringing the SS portion of FICA to what it is today – 6.20% each for both employee and employer (Medicare adds another 1.45% for both employee & employer). The changes made by Ronald Reagan and the Democratic Congress in 1983 were in response to an alarming report in 1982 that Social Security would soon not have enough money to pay all its benefit obligations and the Trust Fund reserves at that time were in jeopardy. Those 1983 changes accelerated previously enacted payroll withholding taxes, made up to 50% of Social Security benefits taxable (over certain income levels), and increased the full retirement age for benefits from 65 to 67 over time, thus reducing program costs for benefits to future retirees. Those changes restored the program to solvency. A key feature of the 1983 amendments was to take Social Security out of the “unified budget” where the Trust Fund assets were reported by President Johnson starting in 1968. Essentially, Johnson’s “unified budget” reflected the Government’s balance sheet as the net of all assets and liabilities, including Trust Fund reserves which were previous reported separately (Johnson did this to mask the extent of the reported budget deficit resulting from the war in Viet Nam). The 1983 amendments also took reporting of SS reserves back outside of the unified budget so that they were again reported separately, as they are today. Even so, the 1968 action was little more than an accounting exercise – no assets were ever actually taken out of the Social Security Trust Funds; rather the Trust Fund balances were simply reflected as assets which gave the impression of a smaller Federal deficit. Again, this practice was reversed by the 1983 amendments, and the 1983 changes restored Social Security to solvency for the next 35 years. The Omnibus Budget Reconciliation Act of 1993 was the work of President Clinton and his Congress and, among other things, raised the cap on taxation of Social Security benefits from 50% to 85%. The remaining features of that bill were budget balancing taxation changes and had nothing to do with Social Security. Social Security’s assets remained separate in the Trust Funds, where they still are today. Neither the 1983 nor the 1993 changes to Social Security resulted in the Trust Funds being “pilfered”; rather those changes were designed to help the program’s solvency. And President Johnson’s 1968 accounting procedural changes did not pilfer Social Security funds either; it was political “slight-of-hand” to reflect a smaller deficit. The Trust Fund reserves are now at about $2.895 trillion. The ”special issue government bonds” which comprise those reserves are interest bearing investment instruments which can be redeemed at any time as needed by Social Security to pay benefits to Social Security recipients. Yes, these bonds represent “IOUs”, just as do any other investment instrument such as individual U.S. Treasury Bonds, CD’s, municipal bonds, annuities and the like, where you pay money for the investment instrument in return for a promise to repay that money along with a specified amount of interest. The difference between these special issue bonds and most other types of investments is that they are backed by the “full faith and credit” of the United States Government, a designation which, in the financial world, makes them “primarily risk free”. This risk designation is unmatched anywhere in the public securities markets which, of course, is why calls for investing the Trust Fund reserves in the securities market have never succeeded in Congress – the risk is viewed as unacceptable. As is the case with everything the Government does, the money – including that used to repay Social Security (redeem bonds) as needed – comes from the U.S. Treasury, which is in turn funded by the U.S taxpayer and, now, borrowed money. Thus, the Social Security Trust Funds can be considered creditors, just like every other loan source the Government uses to pay for its deficit spending. We can make a valid case that those special issue bonds add to the national debt, but not nearly as much as the general deficit spending habits of Washington politicians from both parties for many years now. And sadly, there’s no apparent end in sight. We probably agree that all who loan the U.S. Government money believe in the “full faith and credit” of the U.S. Government and expect those investments to be safe, and I personally believe that Social Security’s trust fund assets are. But Social Security benefits paid out annually will exceed annual revenue collected starting this year, which means the reserves will need to be tapped to pay the difference. And unless Congress acts again soon, the Trust Funds will be depleted in 2034. That won’t mean the demise of the program, but rather that benefits might be cut by about 21%. AMAC is stridently trying to ensure that doesn’t happen. Once again, my sincere thanks for your feedback on the Trust Fund article. Well written and extremely informative. I can’t wait for the next article.